Whether you’re just starting your own daycare or you’re redecorating your preschool, it’s important to make sure that the room’s décor is kid-friendly. You should consider everything from colors to furniture options. When you’re trying to create an atmosphere to encourage a fun learning environment for your students, make sure you keep the following ideas in mind. There are many different colors you can choose to use in your daycare or preschool. However, it’s important to make sure that you pick a color combination that looks good while also staying kid-friendly. Bright and bold primary colors are the best choices for small children. Younger children generally respond well to more basic colors and it’s also the perfect option because these are usually some of the first colors they learn. Having a variety of colors in your classroom is going to go a long way in creating a fun and interactive learning atmosphere for your kids. By using the actual room as a learning tool, your students will love to be in your classroom every day. This makes your job easier and helps the children better understand the colors around them. As you’re getting the space ready for playing and education, one of the first things you need to do is make sure that the area isn’t too full of stuff. Of course, it’s important that your teaching area has all the tools and items that your students will need. However, clutter can lead to easy distraction and disruption. Make sure that the area is as well-organized as possible to help keep your students ready for fun and learning every day. There are many things that you can do make sure that a space is well-organized. Everything should have a place, and at the end of each day, each item in the room should go back in its space. Bins, shelves, and boxes can not only help you keep the classroom organized, but also teach your students that “clean up” time is fun. No matter what time of year it is, it’s important that when children come into the classroom they are comfortable. One of the easiest ways to go about this is to make sure that the room sits at a comfortable temperature. If your area doesn’t already have a programmable thermostat, you should consider investing one. When you’re not changing the temperature all the time, you’ll be better able to keep students’ attention. Remember, when students are comfortable, they’re more likely to listen and learn. If they are too hot or too cold, they’ll have an easier time getting along with their classmates and participate in their activities without struggle. One of the best ways to create a great, fun-filled learning environment is with proper lighting. Without proper lighting, students are not going to want to play or learn. Instead, they will tire easily, become distracted, and may get moody. However, when you have the space well-lit, they’re going to be more energetic, ready to learn, and ready to play with their classmates. It’s important to get as much natural light into the space as you can. This will help keep the kids focused. Open the room’s windows, unless they glare in ways that hinders your teaching. If natural light isn’t possible, make sure that you have enough lighting to make the space fun and entertaining. Add lamps to the room to create cozy reading nooks and encourage creativity, while also changing the overall atmosphere of the room. As you’re planning your learning area, one of the things you’ll need to do is to set up seating. There are several options, and depending on how many students you are going to have, one of these may work better for you. Small Group Seating Areas – In this seating style, you will have tables or desks clustered into groups. You can do this by having each student face the others, such as four tables in a square. Another option is to have small groups in U shaped formations around the room. Large Group Seating Areas – Large group seating areas allow you to address the entire room quickly and easily. This will usually consist of everyone in the room facing one area. You can have tables or desks face the front, or all of them facing in toward the center. Individual Seating Areas – Another option that is frequently used with one of the group seating options is the individual seating areas. 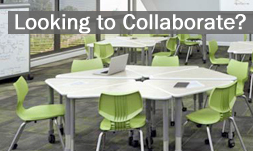 This allows for the teachers and students to work together one-on-one more easily. This could be an area off to the side of the classroom that has a single desk, allowing the teacher to work with a student that is struggling. With daycare and preschool ages, some childproofing of the room could be necessary. Because you are working with small children, it’s important to make sure that the classroom toys and supplies are age-appropriate. Small children can easily choke on small toys such as Legos or doll clothes. Covering outlets and making sure that cords are out of reach are also important steps in ensuring the safety of any children in your preschool or daycare. Make sure that children don’t have access to hot items, such as the stove or space heater. There are many reasons that childproofing is one of the most important things you can do. Of course, you want to make sure that the children are safe and that they feel safe. When your students feel safe, they’re more likely to stay focused, have fun, and not be distracted. As you’re getting your classroom put together, make sure that you’re fostering not only an educative environment, but also one that inspires creativity and fun. Make sure that the children you’re working with feel comfortable in the space you have created. Day Care centres and preschools are being very famous now days but fun and recreation are very important in a preschool. I also own a preschool called Bright Start Academy so I like your idea to use color choices as small kids get attracted to the colors mostly with the bright colors. Childproofing is also a great tip. Thanks for the information.